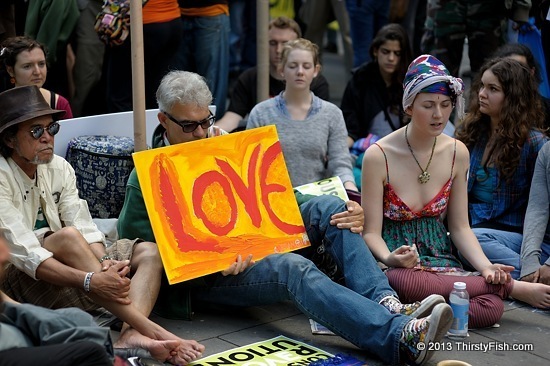 Photographed last year during the Occupy May Day event. In English, the word "Love" represents a whole range of feelings, states, and attitudes, most having to do with strong affection and personal attachment. In most other languages, there are many words for love referring to kindness, compassion, interpersonal attraction, romantic love, sexual love, friendship, platonic love, religious love etc. For example, in Ancient Greek, "agape" refers to the love of the soul, "eros" to passionate love with sensual desire , "philia" to virtuous love, or love of the mind, "storge" to natural affection, and "xenia" to hospitality. In Ancient China, the period between 770 BC and 480 BC produced four schools of philosophy, namely, Confucianism, Taoism, Legalism and Mohism. Of these Mohism promoted the concepts of "Universal Love", meritocratic government, impartial caring, state consequentialism, harmonious society, anti-fatalism and anti-ostentation. Mohism, the philosophy built on the idea that "mutual love by all would bring benefit to all" and "the world is a commonwealth to be shared by all", all but disappeared when, initially Legalism, and later Confucianism became the official government philosophy. Today, in a world where "Let It Be" (Laissez-faire) economic philosophy and the delusory "survival of the fittest" meme globally dominates every aspect of life, from governments to education to our person, it is unthinkable to consider "Love" as a philosophy. But maybe, one day "Love" will rule the world? N.B. The word most associated with Laissez-faire (let it be) economics these days is deregulation. But the term has taken an Orwellian meaning; For large corporations and banks, "deregulation" has come to mean blanket impunity, and while the rest of us are fed glittering generalities about why "deregulation" is somehow good for us, every aspect of our lives are increasingly regulated.